Q1. How to use look command? Q2. How to narrow down search within given string? Q3. Is look search case sensitive? Q4. What else look can be used for? Although the Linux find command does a fabulous job for searching on the command line, there may be situations where a dedicated tool may be more convinient. 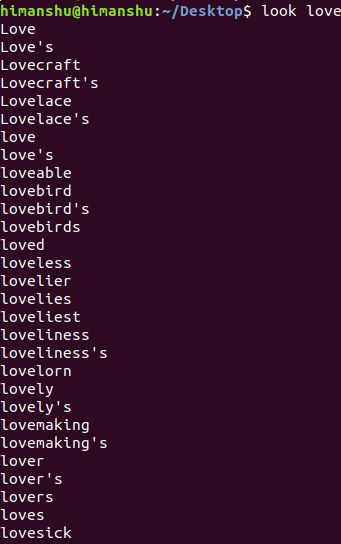 One such case is to find lines in a file that start with a particular word. There exists a command - dubbed look - that does this for you. In this tutorial, we will discuss this command using some easy to understand examples. But before we do that, it's worth mentioning that all examples in the article have been tested on an Ubuntu 18.04 LTS machine. alphanumeric characters are compared and the case of alphabetic charac? Following are some Q&A-styled examples that should give you a good idea on how the look command works. Simple, just provide the word you want to search and the file in which you want to search as inputs to the look command. The above command searches for lines beginning with 'The' in the file 'test.txt'. No output will be produced. However, you can force look to ignore case by using the -f option. So all in all, look is a useful little command line utility that you should be at least aware of, for you never know when it may turn out to be a saviour for you. It doesn't offer many command line options, and majority we've already discussed here. To learn more about look, head to its man page.